The Stingers were shrugged off of any chance to make a positive impression in their home opener. A physically superior Montreal Carabins team took all three points with a 2-0 victory at Concordia Stadium on Friday night. Physicality—or a lack of by the Stingers—became the game’s theme. Despite a stronger defensive display in the second half, Concordia was unable to conjure a formidable offensive threat. The Stingers conceded two goals in the first half. Both of them were scored off corner kicks. The first goal happened courtesy of Carabins defender, Catherine Rochon. Montreal defender Maude Leblanc put her team ahead by two in the second half. She caught a loose ball on the volley outside the 18 yard box and smashed it in the lower left side corner of the goal. 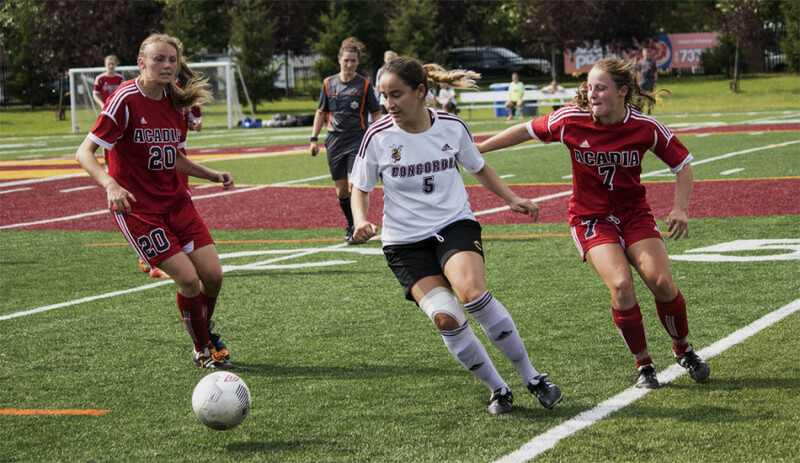 With a draw against the McGill Martlets last week, a result in the Stingers’ home opener would’ve been something positive heading into next game. The Stingers have dropped five points out of a possible six in their opening two games, meaning the next game is a must win for Sanchez and his team. Despite the loss, the team feels there is room for optimism, and they remain adamant about their chances this season. The Stingers will host Université du Québec à Trois Rivières next Friday, Sept. 16 at Concordia Stadium, still looking for their first win of the season.